You’ve been considering that big project for a long time. Really digging in and making some changes. You’re so excited about it that you want to share it with everyone you meet, or even more people than that. And when you finish, you might even want to keep coming up with new ideas to share. You’ve been reading the various websites and blogs, looking at other people’s projects and ideas, and it finally struck you, “Why can’t I do this too? Why don’t I start a blog?” It’s not that difficult, and it can be a great outlet to share your ideas, and get new ones, so there’s nothing stopping you from doing it. To help you start your blog, consider the following ideas to make sure you get off to a great start. A key factor in starting a successful blog is a sense of focus. Pick a single aspect to concentrate on. You can expand into more areas later, but initially having a specific niche where you specialize can help bring you readers and establish your expertise. You can choose from a number of different types of focus. You can zoom in on step by step projects, posting photographs of each day’s work, or you can concentrate on a single type of project, showing different aspects of kitchen remodeling, for example. You could pick a theme or a style, Colonial Farmhouse perhaps or Art Deco, and talk about how to achieve that look in a variety of projects. But picking a single area to excel makes your site a favored destination for people interested in it, helping you establish that critical core readership. Once you have a focus in mind, you’ll need to choose a domain name that evokes that focus. If it can be clever and memorable, so much the better, but don’t obsess over this. Set aside a few hours to choose your name, not a few days. One tactic is to generate a quick list, one after the other for twenty or thirty minutes. If you have trouble thinking of some, throw in one named after you or anything else distinctive about you personally. Silly, made up words are okay as well. Many well-known companies have names that were unknown in their field before they came along, like Google or Bing. Once you have that list, cut all the ones that really don’t work. Then spend a few minutes ranking the rest. Try combining a few, or adding other words to improve them, then take your top five and check to see if they are taken. You’ve spent less than an hour and have a name that’s perfect for your new blog. This is a research task, and will require some effort and time. You need to find an inexpensive web hosting service that has a good reputation for reliability, ease of use, and good customer service. There are a number of them, and there are usually deals where you can get discounts for the first several months or even a year. Some offer free domain names in addition, so be sure to factor that into the cost. Unless you have some technical background or some other good reason to choose otherwise, I would recommend WordPress to design your blog. It’s the big name in blog platforms and many hosts have extra support for it, like one click installation. It’s easy to use, powerful, there’s a ton of support information about it on the web, and it’s free! Wordpress does offer some premium items you may want to consider as your blog grows: a premium framework designed for an image heavy blog is a good investment, and very affordable, as is a good selection of plugins to make your work even easier. One of the things that kills many new blogs is an irregular update schedule. People don’t know when to expect the next post, so they stop coming back to check. Set a schedule from the start, and let your readers know your post schedule in your intro blog post. You can change it later but try to stick to it as much as possible. Make it as frequent as you can, but don’t over commit. You don’t ever want to miss a post, so keep it reasonable, no more than three or so per week. This also gives you a deadline to meet, which can help some people stay on track and stay committed to their project. If you are doing projects, the best way to showcase your work to your readers is with pictures to compliment your text. Don’t try to make do with photos from your smartphone; invest in a mid-range priced camera and study basic photography if you don’t already have the skills. You want your pictures to be clear, well composed, and impressive. Get the skills and equipment to make that happen. You don’t need to be a professional, but sloppy photos won’t gain you readers. Also, see if you can incorporate video into your blog as well. A virtual tour of a project can really be impressive. Your site should have some flair, with a logo that’s quickly recognizable for your readers. If you’re not familiar or comfortable with design work, consider consulting a graphic designer. This doesn’t have to cost hundreds of dollars; sites like Fiverr can get you a simple and stylish logo at an affordable rate. 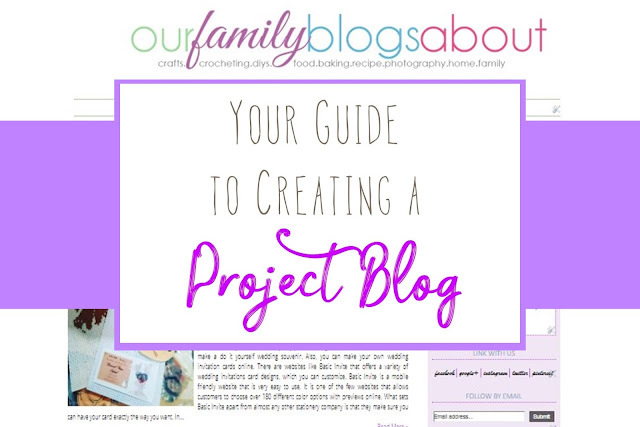 You’ve got all the pieces in place, it’s time to pick your project and write your first post. Your writing ‘voice’ will mature over time, but you might have to give it a little more thought before you start. Will you be chatty? Professional? Technical? Will it be from your point of view or will you only talk about the projects? Most bloggers recommend a relaxed style with a lot of your personality in your posts. People want to know who you are through your writing, so put your personality into your posts. Talk about your opinions, your experience, and your choices. Now that you have your first post up, stick to your schedule, work on projects related to your focus, and get people involved using interesting pictures and video. Watch your comments and interact with your readers. You’ll start to form a little community, and you’re sure to get suggestions on what to do next or what they would like to find out more about. Always listen to suggestions, but remember, it is your blog - you get to decide what to work on next. So choose what you love, enjoy yourself, and share the joy of your work with others!